The festival of lights is a dull day for newsrooms. The flow of news, at best, is lethargic and the newsrooms largely empty. However, the show must go on. There's only so much airtime (and webspace) that you can fill in with the visuals of colourful lights and lamps. The debate over whether or not the Diwali is dull sans the sounds of firecrackers, too, has had its fair share of run-time. People making ludicrous statements about one of the wonders of the world, too, have decided to take break. It is at this time that the well-oiled PR machinery of the prime minister gives something that the newsrooms can gleefully run throughout the day and night and maybe the day after. This show has been on every year since the time the country has decided to turn 'right'. The prime minister, after his customary Diwali greetings to the nation, makes a grand spectacle. 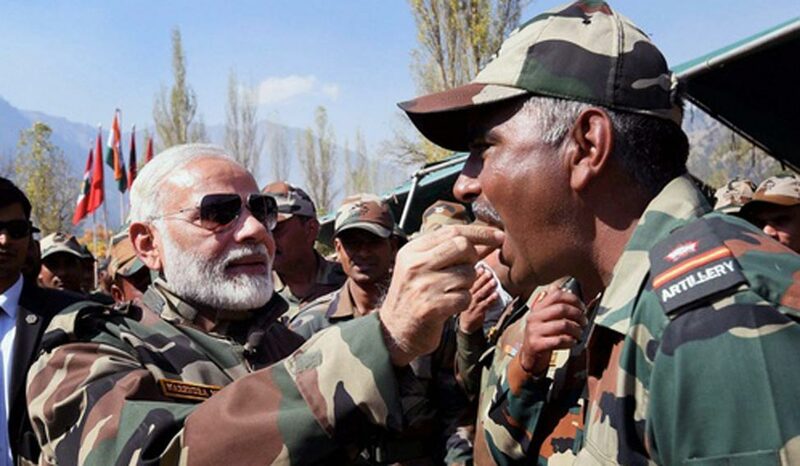 He calls upon his brothers-in-arms at the border, sharing sweets and sweet talks. He commends them for their bravery, the sacrifices they make and how he feels one with them. The hyperbole is peppered with endearing phrases and words—“you are my family”, “It's a privilege to spend the day with you”, “deeply touched by the reception”, and the like. The border areas may vary, the words and the order in which they are solemnly uttered may change, but the show remains the same. It works, like a miracle. The anchors and reporters never seem tired of seeing the man in camouflage, chit-chatting with men in uniform. The desk is only too eager to run the news on top of the site for a few hours at least. The work has been done, the reward has been heavy. The photo-op hasn't gone in vain; it never does! The newsrooms aren't the only place this 'goodwill' gesture is celebrated with much fanfare. For the social media warriors of the 'lotus' lot, the show grants enough ammo to showcase to the rest of the world how their globetrotting prime minister takes no rest even when the rest of the country is busy exchanging sweets and polluting the environment with noises too loud. Sure, the valiant Army men who may have to forego the comfort of homes and warmth of loved ones on every festival to ensure that the rest of their countrymen sleep and celebrate in peace, need to appreciated. They do deserve every word of praise and acclaim lavished on them for the many sacrifices they make. Indeed, the visit may even lift the spirit of the few Army men who are (arguably) lucky enough to be clicked with the prime minister. But the fact remains—the visit is a sure means to hog airtime, webspace and headlines. There is only one purpose that seem to have been served, and that is self-aggrandisement.